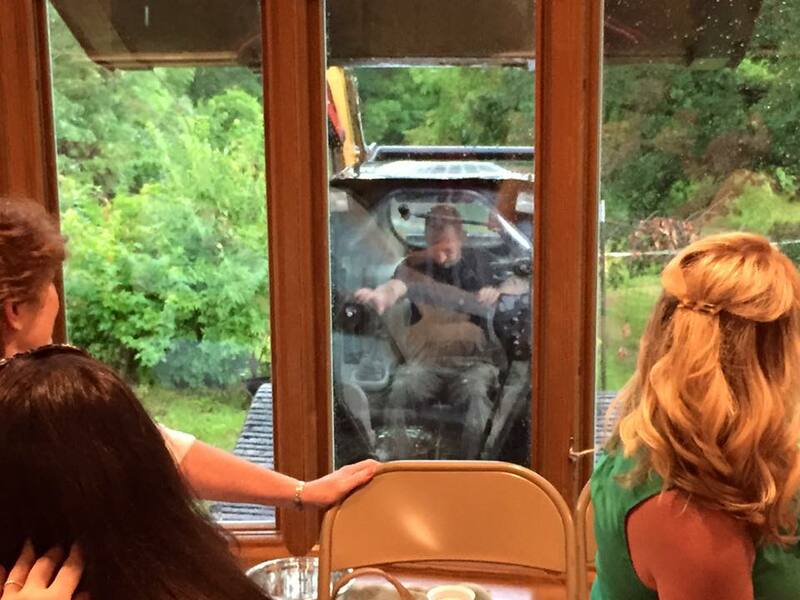 Several months ago, I was asked to host my sister’s bridal shower. (She’s getting married in August.) I agreed. A date was set. All I had to do then was everything else. Here’s my confession: Generally speaking, I hate “showers” (the party, not the method of cleaning oneself…just to clarify). Baby showers. Bridal showers. Not sure if it’s the cheesy games or the social obligation or just the fact that I’m a raging introvert, and I find such parties (populated largely with people I don’t know) completely exhausting, but I just don’t enjoy them. I attend them willingly and fairly often, knowing that attendance at such events and the gifts we bring do mean something, but I have never been the sort of person who gets excited about them. Anyway, when faced with hosting such a party myself, I decided that I wanted it to be different from “normal” bridal showers. 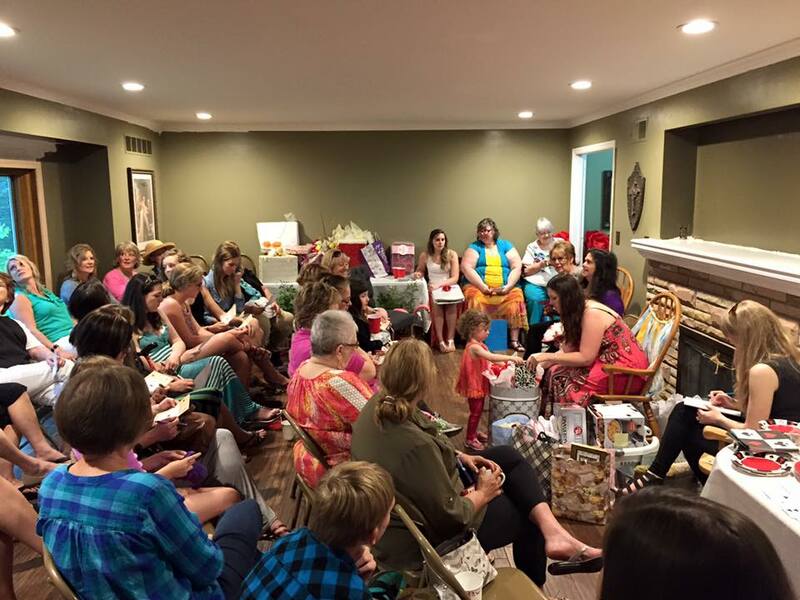 Mostly, I decided, hosting a normal bridal shower would make me want to stab myself in the eye with a fork, and that seemed unpleasant. So, like any good millennial, I went straight to Pinterest. And I typed “bridal shower” into the search bar. And it came back with a million and one possibilities, most of which seemed to involve making “wedding gowns” out of toliet paper…because that’s totally a thing. There were wine tasting bridal showers and coffee shop bridal showers and strawberry field bridal showers…the list of possibilities is endless really. But none of them seems quite right. And while it was tempting to throw a bunch of wine at a commonly boring party and see what happened, it also seemed a little dangerous. “No wine.” I thought, sadly, clicking on yet another list of themes. And so it was that I found our theme, a blip on the radar. Hmmmmm…Alice in Wonderland. And it all sort of came flooding back. The trip to Florida where my sister played “Alice” over and over and over in the van’s VCR. Nothing else allowed. (As younger sister I didn’t really have a say.) The “Alice” dress she cherished with the white rabbit on the apron. It was decided. 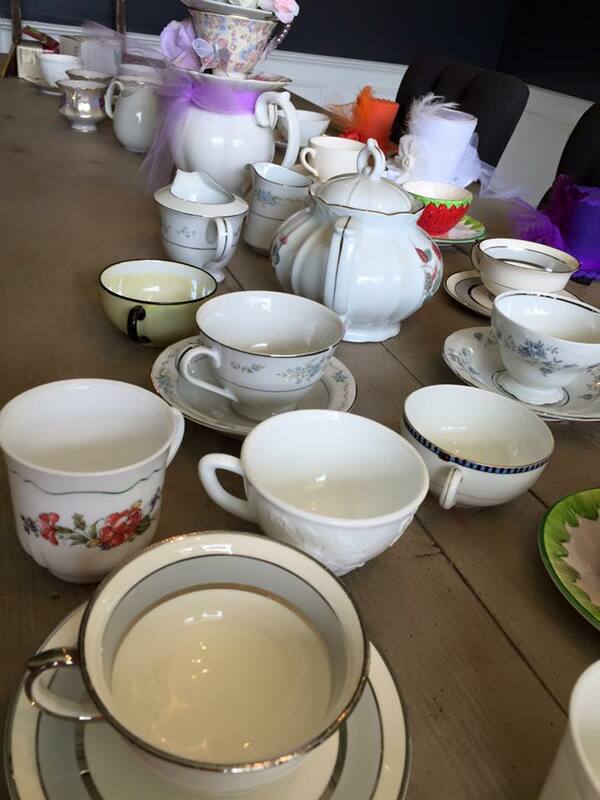 For better or for worse, my sister’s bridal shower would be “Alice in Wonderland” themed. 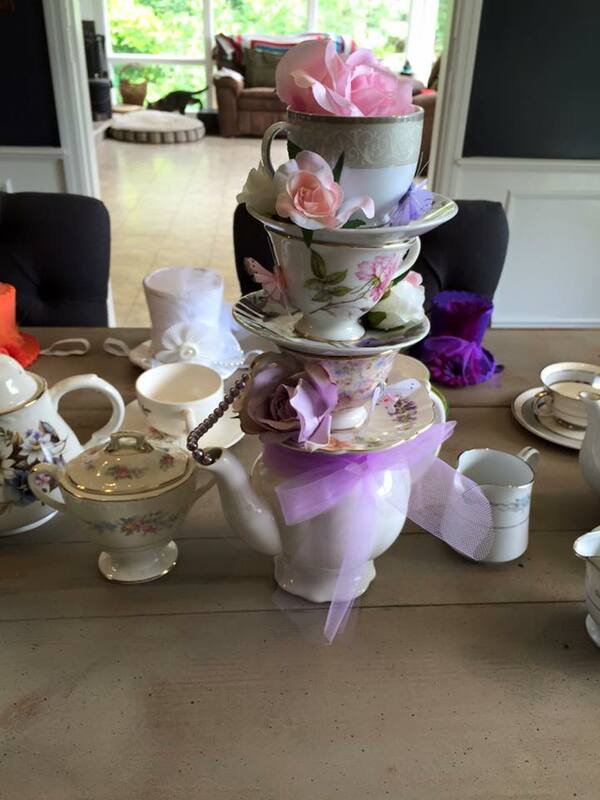 I found printable invitations, recipe cards, and games on Etsy, along with “photo op” mad hats and an adorable centerpiece for the obvious Mad Hatter’s Tea Party. (For the record, about a week and a half after the party, my dogs, Piper and Amelia, totally made off with the mad hats and shredded them…because that’s my life.) 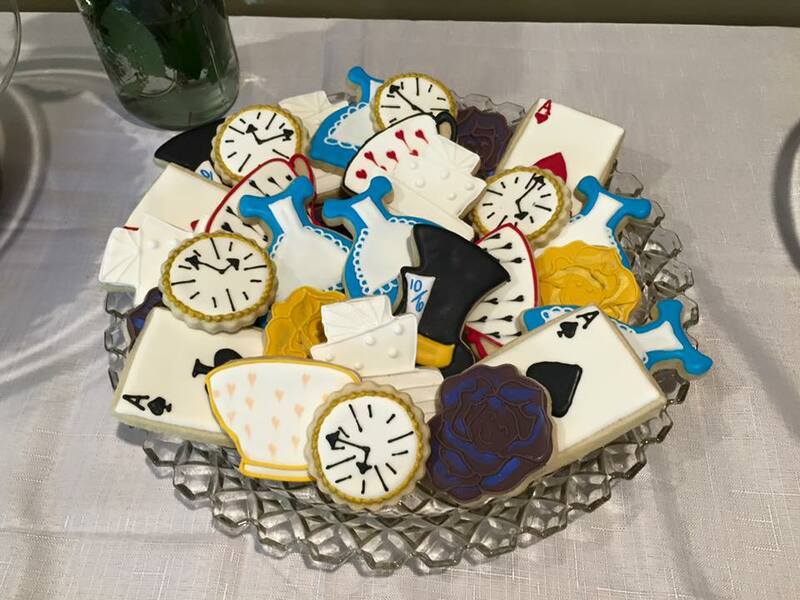 I decided on Alice in Wonderland themed cookies (courtesy of my massively talented baker/cousin who runs a cookie baking business), chocolate and vanilla cupcakes with white frosting painted red (courtesy of another massively talented cousin), and a “Very Merry Un-Bridal Shower” Cake for the sweets table. (When having a shower of any kind, the sweets table is of the utmost importance…I think. Or maybe I just like cake and cookies.) I spent over a month collecting vintage tea cups from Goodwill, eventually finding a full set for her shower gift in addition to all of the single cups I bought for the guests to use. 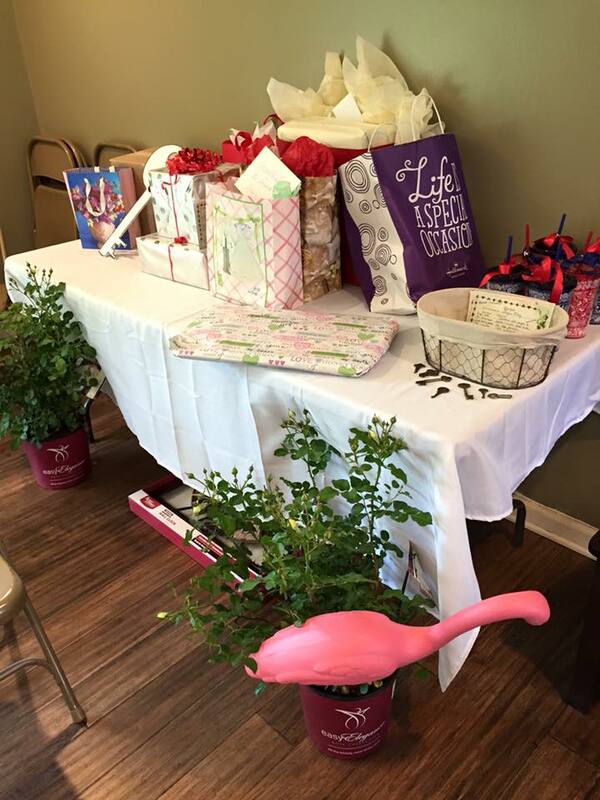 Right around fifty people attended the shower. I cannot believe that many people fit in my living room, but, push come to shove, they do. We had roughly fifty guests! I can’t believe that many people fit in my living room. 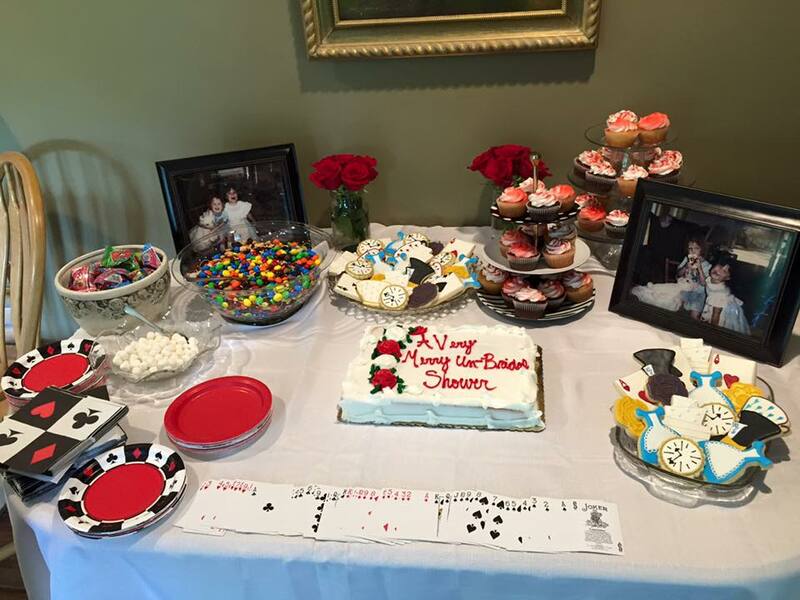 My plates, part of the Vegas themed line from the local party store, worked equally well for the Queen of Hearts. 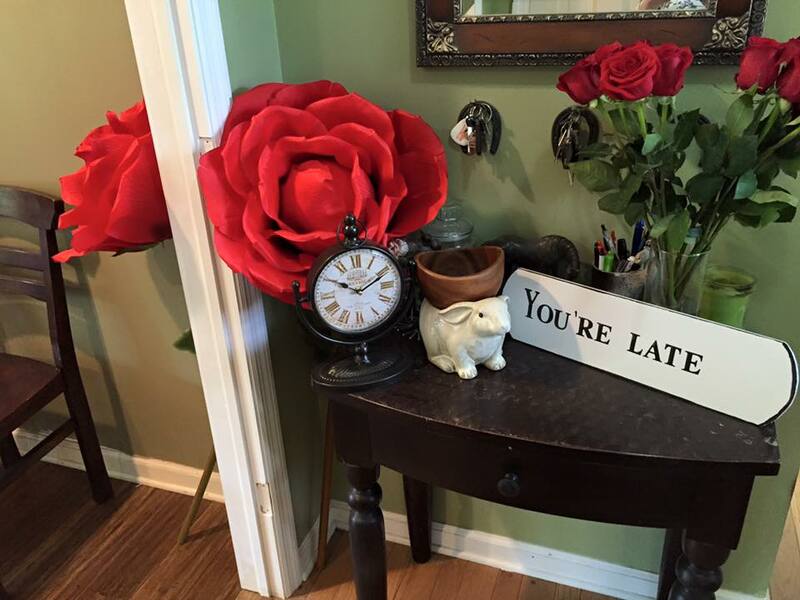 I had a lot of red roses (Rainforest Alliance Certified from Costco) and playing cards to contribute to the “Queen of Hearts” themed living room. 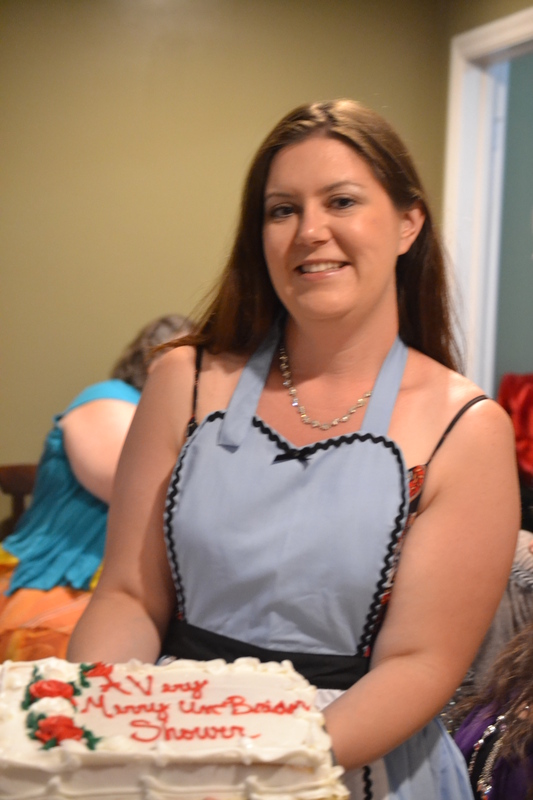 I had white frosted cupcakes that we painted red and “A Very Merry Un-Bridal Shower” cake from my favorite local bakery. (Delicious.) We rounded out the table with just a few photos of my sister (at roughly five years old) dressed as Alice. And seriously, look at these cookies!!! They were as delicious as they were beautifiul. I also made room for a smattering of Flamingos in and amongst the Queen of Hearts decor. I also used Flamingos to emphasize the signs along the road for the party. 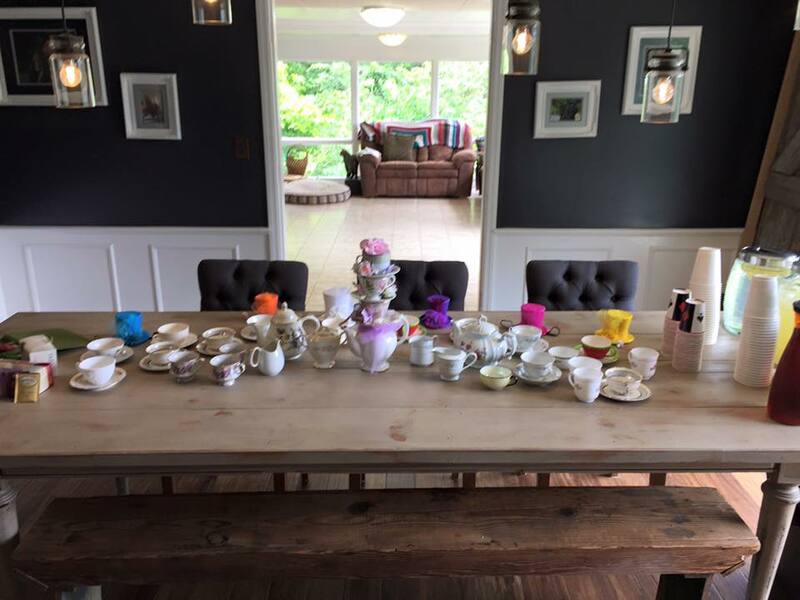 My dining room was fully decked out as a tea party. Guests had their choice of vintage tea cup. My Etsy ordered centerpiece. Which is adorable! 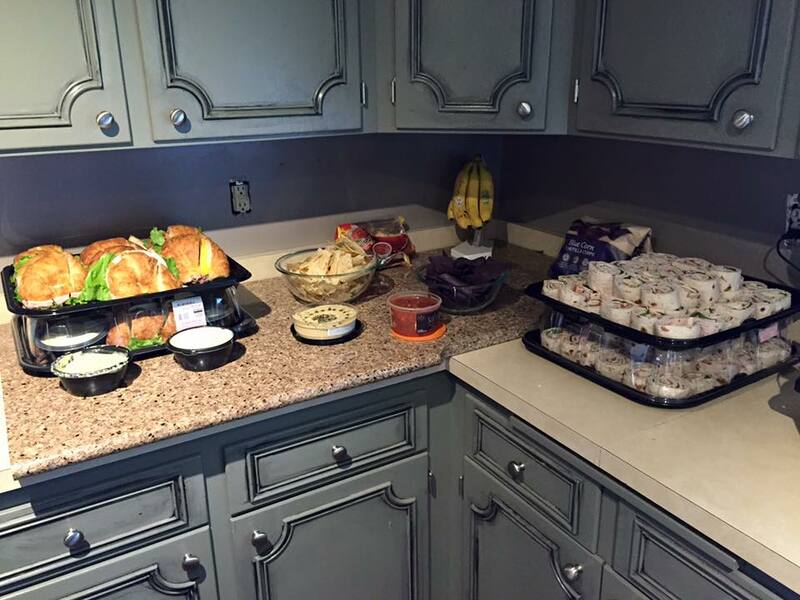 With fifty guests, I decided to let myself off the hook a little bit on “Real” food. 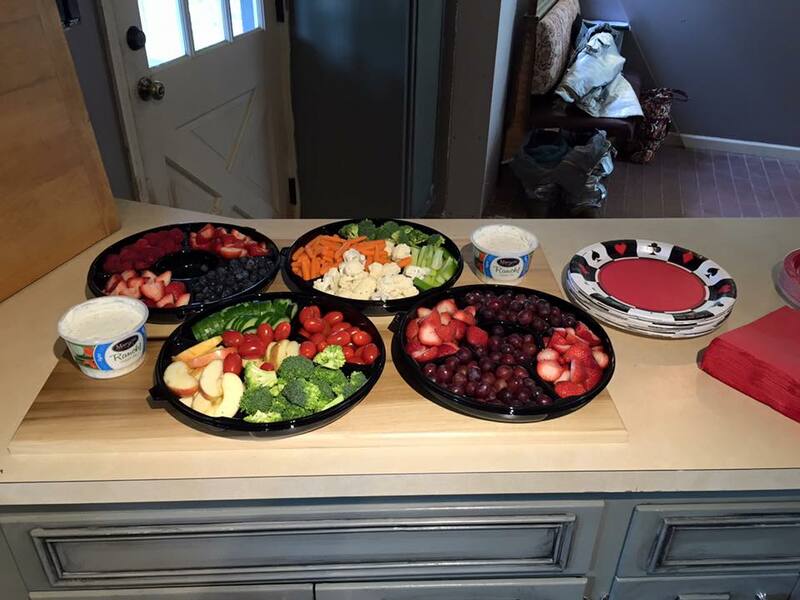 Most of it came on pre-made trays from Costco. It was a delightful walk through the “looking glass” that day. The theme so cleverly followed—-no matter how you got the materials. For not liking any kind of a shower affair, you my dear, are one heck of a hostess ! Showers of salutes ! Oh my God, you are so funny! Glad you didn’t stab yourself with a fork, lol! Cute, cute shower and those cookies are incredible! Best wishes to your sister! I’m a bit of an introvert, too. And, those shower/parties really aren’t my thing, either. However, I loved your creativity with the theme and decorations! 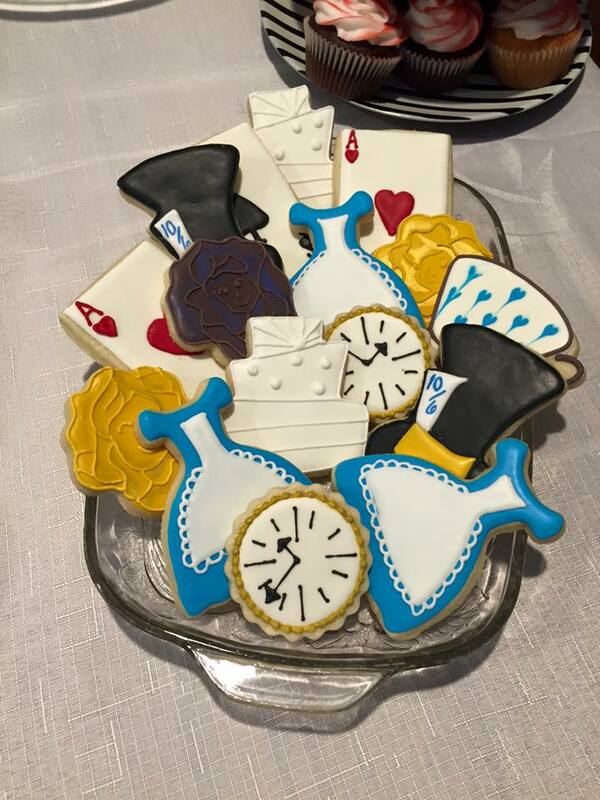 The Mad Hatter’s tea party was such a cute idea, and the cookies were beautiful! Your party looked like a huge success. All the best to your sister! You’re catering my next shower. This is terrific! Thank goodness you broke the rules, or she would have been wearing one of those dang hats made from all the gift bows (I guess it would have went well with the toilet paper dress). You are so sweet. Despite all of the madness, the shower (and the whole weekend in general), was a big success in my book. You are such a good sister to have really gone the extra mile, and I was SO happy I could do the cookies for you and that you liked them!! And really, when you think about it, it wouldn’t have been Alice in Wonderland without a little madness, would it?